Curious which new Sara Gabriel accessories we will be getting at Blue this season? Here is a countdown of just a few of our favorite styles from New York Bridal Market last weekend! Can’t wait until 2015 to see the new collection on stores? Give us a call to see them all for yourself during our Sara Gabriel trunk show on November 16th & 17th. Bonus: If you bought your dress at Blue, you can attend our Sip & Style Soiree on November 15th and get personally styled by Sara Gabriel during our trunk show event, while getting an amazing discount on your accessories! The Lindsay hair chain is the perfect hairpiece for a bohemian bride. Dainty and chic, this style goes perfectly with so many of our Wtoo and Love Marley dresses! One of our favorite sets of earrings for 2015 are the Matty earrings. 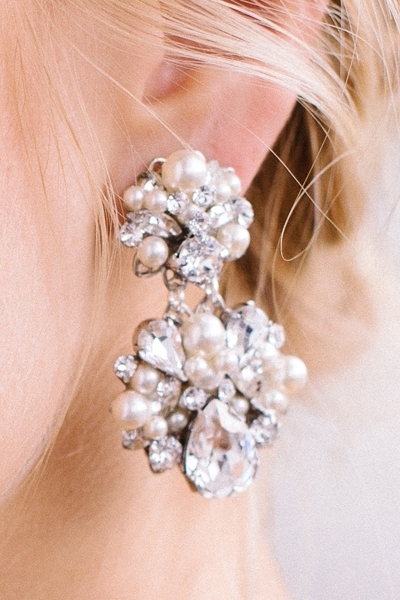 We feel like they have the perfect amount of bling to make a statement, but are still very elegant and traditional with the balance of the pearl detail. These earrings would be perfect with a vintage-style lace dress or a classic satin style. The Haley skirt is so fun to add to any sheath style dress or even a short dress! It’s an easy way to wear two dresses in one! Just by adding the Hayley skirt on for your ceremony, you can turn your dress into a ballgown for the ceremony and then just take off the skirt and voila, you have a second dress for your reception! The Skylar halo is just so adorable, we can’t even stand it. Enough said. Our absolute favorite accessory for 2015 is the Josephine necklace. The perfect amount of shoulder bling to step up any strapless dress and make it into an absolute show-stopper!